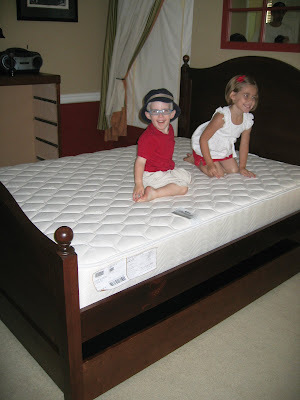 After nearly 3 months of waiting, Mason's bed finally arrived. It's beautiful and well made. We bought him a full-sized bed with a trundle because we anticipate that he will be very tall and need the space to stretch out. The bed will also be great for visitors (come on over!) and sleepovers for the kids. 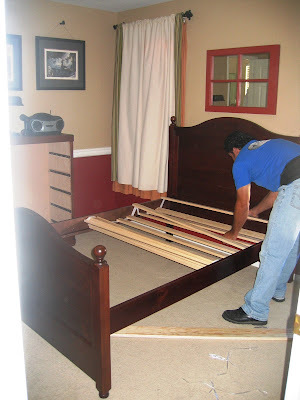 This was one of the two guys who installed the bed. Here he is laying out the slat roll. They installed it in about 30 min; they knew exactly what they were doing. 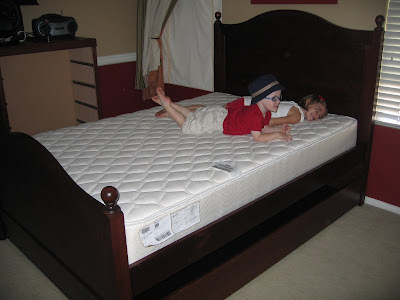 The kids loved laying down all over the bed to see how comfy it was. They look so small on the bed now; I know that will change. 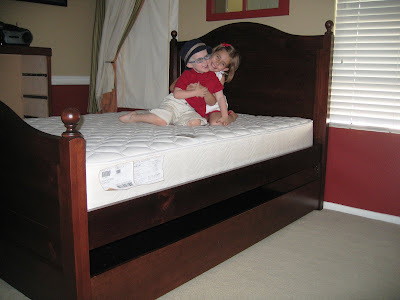 I wondered if Madeline was happier than Mason about the bed; she kept hugging him and kissing him. Here's the happy boy; what a smiler. Oh, yeah! A big boy's bed for Mason.....And that he is!